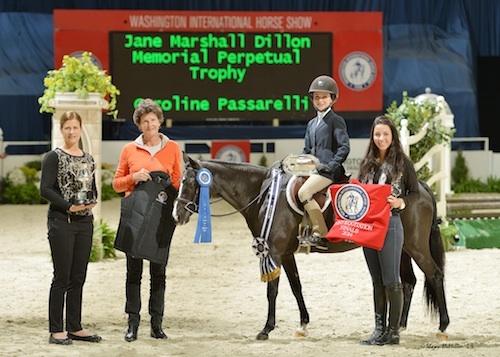 Washington, October 26, 2014 – The 56th Annual Washington International Horse Show (WIHS) wrapped up another historic week of show jumping in the nation’s capital by adorning ponies with ribbons galore at downtown D.C.’s Verizon Center. Armani, owned by Pretty Penny Farm and ridden by Claire Campbell, took Grand Champion Pony Hunter honors and was presented with The Miles River Moonglow Trophy donated by Scott Novick and Rustic Woods on Sunday. The WIHS Pony Equitation Finals were held in the afternoon with a win for Caroline Passarelli. The WIHS Regional Finals concluded the day with victories for Thea Bitar and Allison Kilroy. 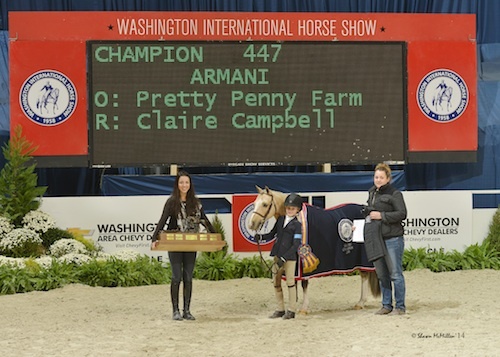 A 10-year-old Welsh Pony gelding, Armani carried Campbell to her first-ever division championship in the Small Pony Hunter sponsored by Further Lane Farm. For the benchmark achievement, she was awarded The Stombock Saddlery Challenge Trophy donated by Stombock Saddlery in Memory of E.P. (Bud) Stombock. Campbell, who hails from Cochranville, PA, and Armani became fast friends just weeks ago before starring in the 11-year old rider’s second appearance at WIHS. “He’s really fun, a great jumper and he has a way better canter than any other pony,” she said. 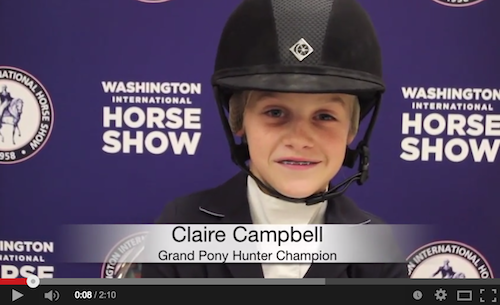 Watch an interview with Claire Campbell! Armani – a breeding stallion until he was seven – adds a charming sass to the small pony hunter division. “He’s sweet, but he wants to eat or bite everything. He has a lot of personality,” added Campbell. That personality, while maybe problematic in the barn aisle, pays dividends in the show ring. Armani scored an 87 for Campbell to win the Stake and claim the Best Pony Hunter Stake Round Award. They also finished first on Saturday and were fourth under saddle. Arms full with prizes, Campbell returns home on Sunday promising Armani plenty of treats for his performances. She, on the other hand, has restful plans for herself. “I am going straight to bed,” she concluded with a smile. 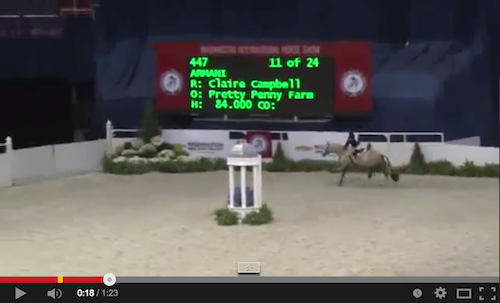 Watch Claire Campbell and Armani in their winning stake round! Playing runner up to Campbell in the Small Pony Hunter Division was Sophie Gochman and Rico Suave owned by Ponies & Palms Show Stables. The pair won the Handy with an 86 for Reserve Champion, along with another second place over fences and third under saddle, but Gochman didn’t leave WIHS without a top tricolor. In the Medium Pony Hunters, she and Truly Noble, owned by Pegasus Show Stables, won the Stake to take Champion and were second over fences and third in the handy class. 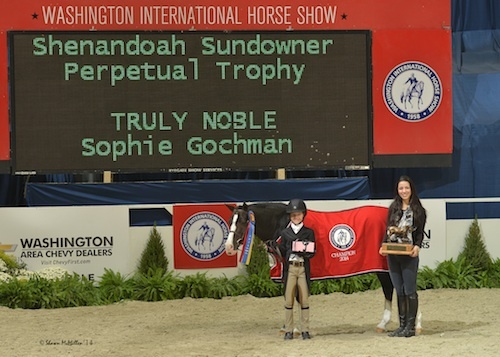 She was presented with The Shenandoah Sundowner Perpetual Trophy donated by Evan Coluccio and Ashmont Farms, Ltd.
Armani and Claire Campbell in their grand champion presentation. Reserve Champion for the Medium Pony Hunters stayed in the family and was presented to Mimi Gochman after she and True Love owned by David Gochman were second in the Handy and also second and fourth over fences. 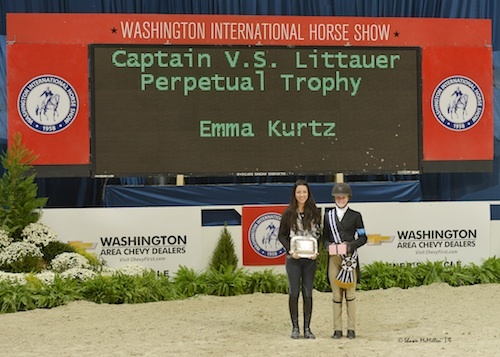 Mimi Gochman also accepted the Potomac Trophy for High Score Junior Hunter Rider on a Pony sponsored by Riverview Farm, LLC for the second year in a row. 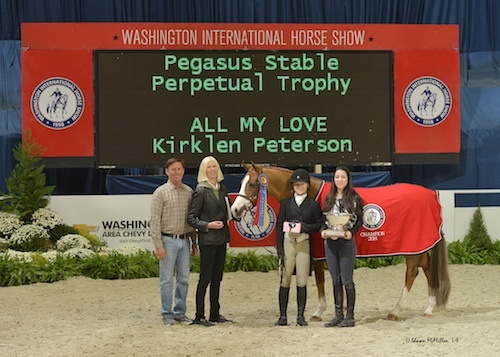 The Pegasus Stable Perpetual Trophy, donated by Ms. Fenwick Kollock, was claimed by Kirklen Petersen and All My Love owned by Dr. Betsee Parker after a Stake win clinched the Large Pony Hunter Championship. They were also second and third over fences. Truly Noble and Sophie Gochman in their championship presentation. Emma Kurtz of Hudson, OH, and Storyteller owned by Fair Play Farm, chased Petersen as Reserve Champion (they placed first, third, and fourth over fences and were fifth under saddle), but redemption came by way of The Captain V.S. Littauer Perpetual Trophy donated by Hugh J.B Cassidy, III, Mrs. William Dillon and Miss Marion Lee. She accepted the trophy as Best Child Rider on a Pony, sponsored by Gotham North. Recognized for demonstrating the highest quality in horsemanship and sportsmanship combined with good appearance and courtesy, Kurtz won the award for the second time after also impressing the judges in 2012. 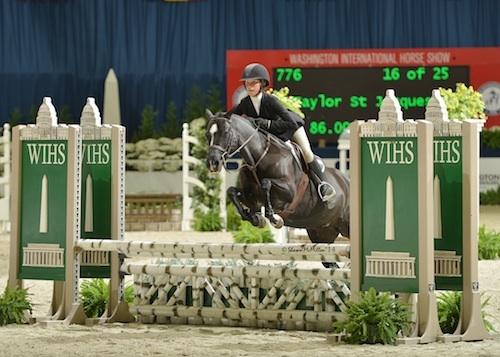 Later on Sunday, the young riders competed in the WIHS Pony Equitation Finals with a win for 13-year-old Caroline Passarelli of High Falls, NY. Trained by Robin Greenwood, Passarelli rode Little Black Pearl to the high score of 87 over fences and came out on top after the ride-off under saddle. She was presented the winning Jane Marshall Dillon Memorial Perpetual Trophy, donated by the friends and students of Mrs. Jane Marshall Dillon. Taylor St. Jacques finished second, Ellie Ferrigno placed third, and Wylie Nelson earned the fourth place honors. Passarelli has had 21-year-old Little Black Pearl for four years. The pair also won the Small Pony Hunter championship in Harrisburg last week and this was the rider’s last show on her and a special win to cap off their partnership. 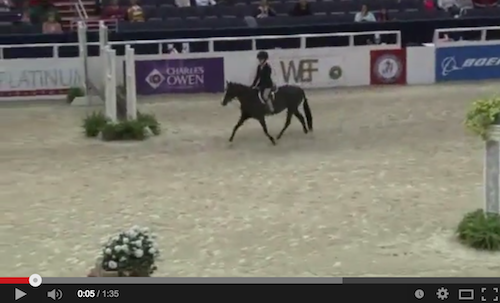 Watch Caroline Passarelli and Little Black Pearl in their winning round! Caroline Passarelli and Little Black Pearl in their winning presentation. 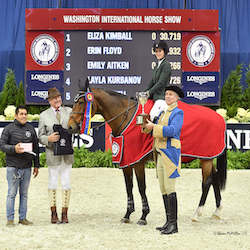 Concluding the week of competition at the 2014 Washington International Horse Show were the Regional Hunter Championships. 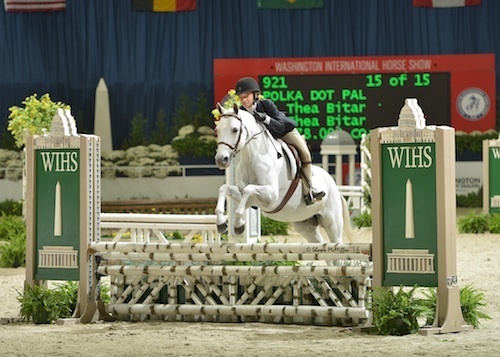 The WIHS Regional Pony Hunter Champion was Polka Dot Pal ridden by Thea Bitar. Bitar (13), of McLain, VA, trains with Ian McCartney and this was her first time qualifying for the final at Verizon Center. Reserve champion was Blackberry and Grace Fulla. To earn the championship, Bitar and Polka Dot Pal won the final class of the division on Sunday with the high score of 80 over fences. Kendall Youngblood and Pajama Party placed second with a score of 78. Sabrina Daniels and Stoneridge Show Stables’ Masquerade were third with a 76, and Olivia Carmouche and Mary Elizabeth Cordia’s Jumpin’ Jack Flash placed fourth with a score of 72. 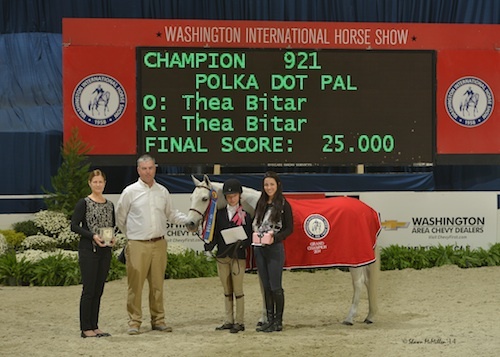 Polka Dot Pal and Thea Bitar in their championship presentation. 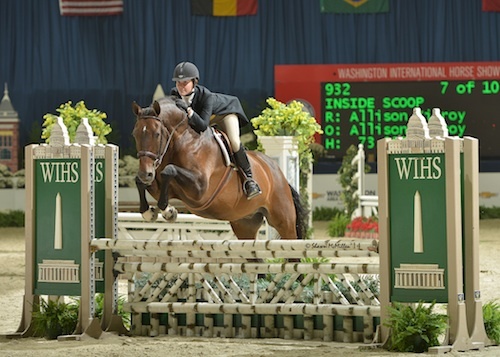 The WIHS Regional Hunter Horse Finals followed with a championship win for Inside Scoop and Allison Kilroy. 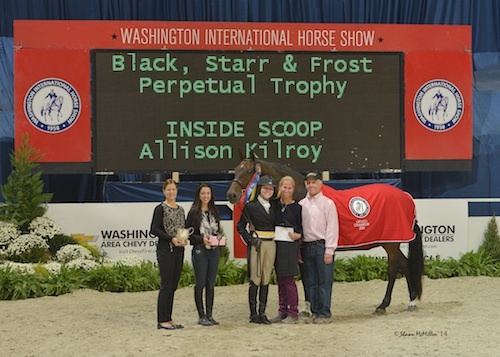 They were awarded The Black, Starr and Frost Perpetual Trophy after winning the division’s final class at Verizon Center with a high score of 80. Hannah Showell and Unbelievable finished second with a score of 77, and Brittani Director placed third with a 73. Isabell Stettinius and Guest of Honor finished fourth and earned the division’s reserve championship overall. Inside Scoop and Allison Kilroy in their championship presentation. Kilroy, 17, of Severna Park, MD, trains with Amy and Streett Moore at McDonogh School. She leases Inside Scoop a.k.a ‘Tank’ from the school and has ridden the horse for two and a half years. 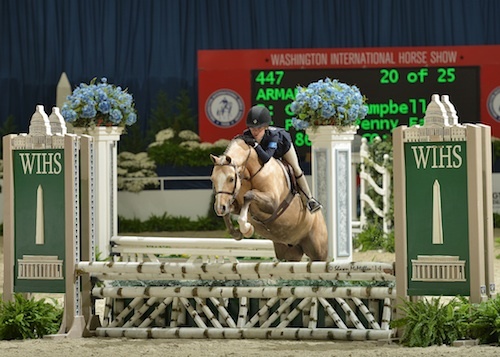 The Washington International Horse Show thanks their dedicated exhibitors, sponsors, staff, and spectators for supporting 56 years of show jumping in Washington D.C. The 2014 event was a remarkable one, and WIHS looks forward to welcoming everyone back in 2015. For full results and more information, please visit www.wihs.org. 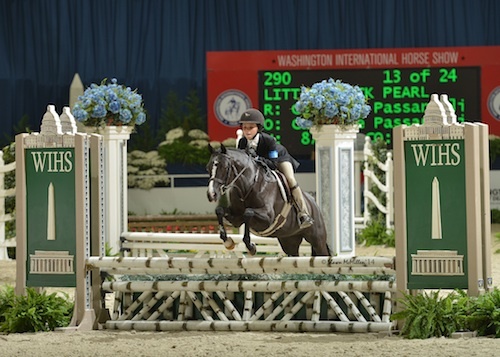 An equestrian tradition since 1958, the Washington International Horse Show is the country's premier metropolitan indoor horse show. 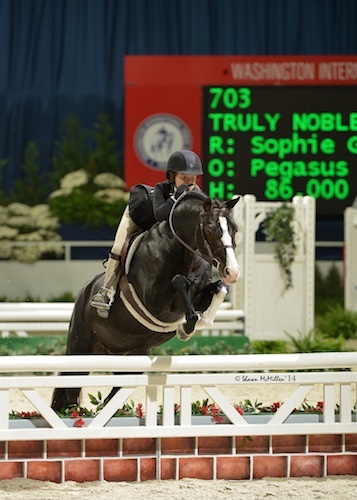 Each October, more than 500 world-class horses and riders, including Olympic medalists, arrive in Washington for six days of exciting show jumping and hunter competition. Highlights include the $125,000 President's Cup Grand Prix (a World Cup qualifier), the Puissance (high jump) and WIHS Equitation Finals featuring the country's top junior riders. Exciting equestrian exhibitions, boutique shopping and community activities, such as Kids' Day and Breakfast with the Mounted Police, round out this family-friendly event. 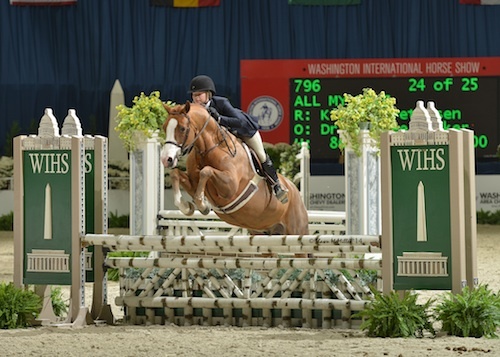 WIHS is an official USEF Heritage Competition and is recognized as a Top 25 Horse Show by the North American Riders Group.